Cloud CMS allows you to store and manage all types of documents centrally - including Microsoft® Office and PDF files - without installing any new hardware or software. As you upload each document, we'll handle its secure storage and immediately enable versioning, indexing, metadata / tagging, and commenting. Additional features such as multilingual support may be activated at any time. Every project you create has it's own document library, letting you invite collaborators, grant roles and rights and work with documents right from your desktop. 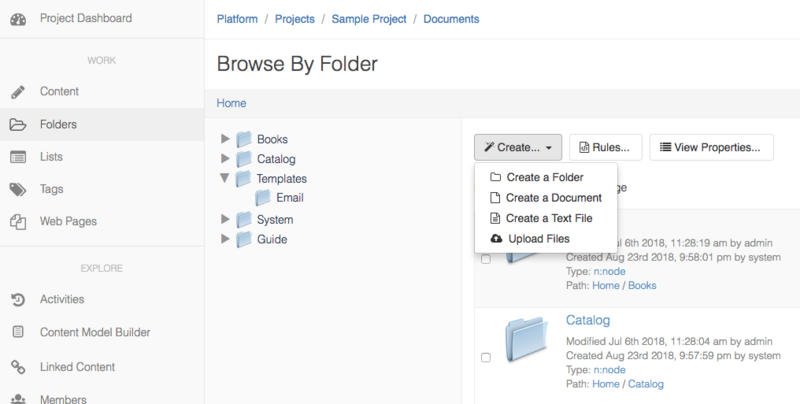 Drag and drop documents right from your desktop or upload them via the web interface. 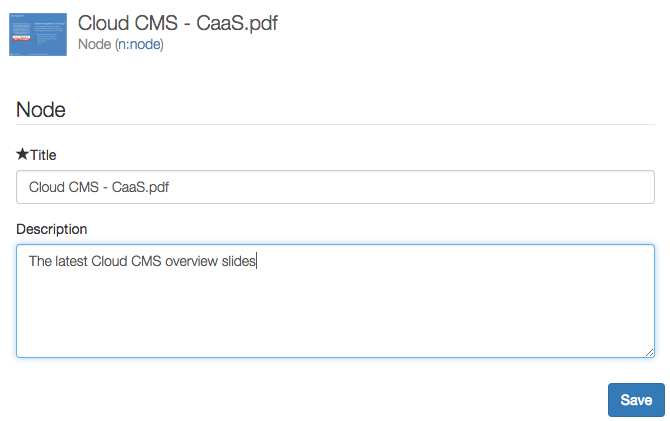 If you use WebDAV, FTP or CMIS, connect to Cloud CMS to copy files right into place. Cloud CMS supports popular file formats including Microsoft Office, PDF, images, audio and video formats. Everything in Cloud CMS is point and click. Add metadata to your documents using forms or by working with simple mobile-friendly JSON. Everything from content modeling to server-side scriptable behaviors is configuration-driven. No coding. No server restarts. Take control of the lifecycle of your documents. Assign content editing tasks to other collaborators and track the execution of those tasks from start to completion. 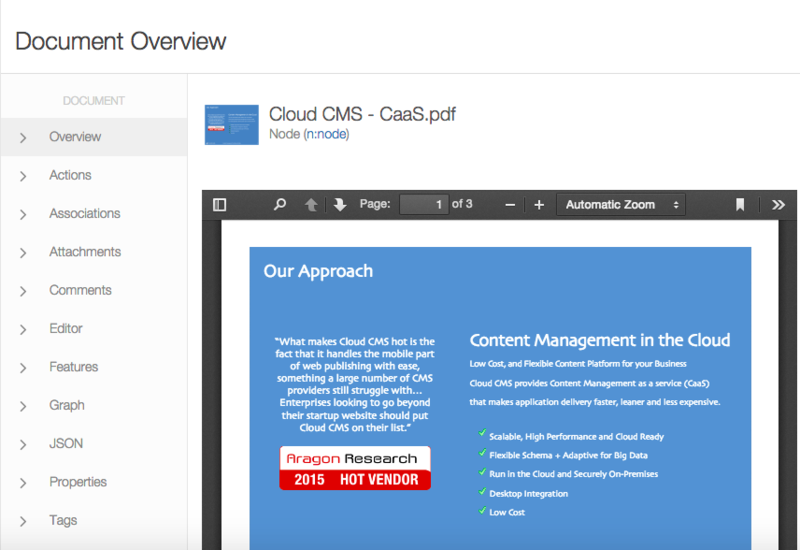 As changes are made to your documents, view them right away within Cloud CMS. No third-party plugins or extensions required. Everything runs right in your browser on your desktop or mobile device. Your documents can now take advantage of everything the underlying content graph has to offer, including comments, tags, search, structured query and the entire content modeling facility and data dictionary. Connect Cloud CMS to your Email Server to receive project and workspace invites, workflow notifications and task summary reminders each day.